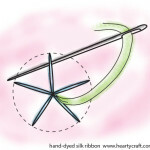 I had a blog previously, had been blogging about needlework stuff for five years and got quite a few readers. I had been tweaking the design of the blog every now and then, and one day after suspending the blog for a couple of days for another of those refurbishments, I realised I cannot bring myself to open it again as it takes so much of my time. So I left the things where they were (with the abandoned and closed down blog) and jumped into setting up my craft business, designing kits, and dying ribbons. Now that has been definitely taking all of my time up until now, but I got nostalgic about the times of blogging and even though I still don’t feel like I can write very often, there is an urge to share things and news. So here I am, starting blogging again! 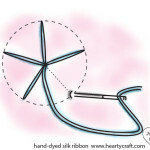 The new blog has been created, and the plan is to share ideas, projects, and tips about silk ribbon embroidery or ribbon craft here. You are always welcome to ask questions or suggest subjects to discuss. I’d be delighted to hear from you by email or, alternatively, feel free to leave a comment here. It’s always hard to pick up a subject as there are so many things I’d like to share! What about some basic stuff? Do you fancy stitching woven spider’s web roses? 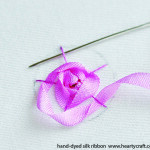 It’s soooo easy and it’s such a quick way to make a lovely rose! There’re many other ways to create those pretty flowers, but this one is my true favorite. How many times have you used these satin roses? 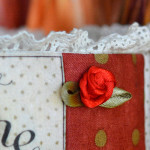 You can easily replace them with the stitched rose in your craft projects. 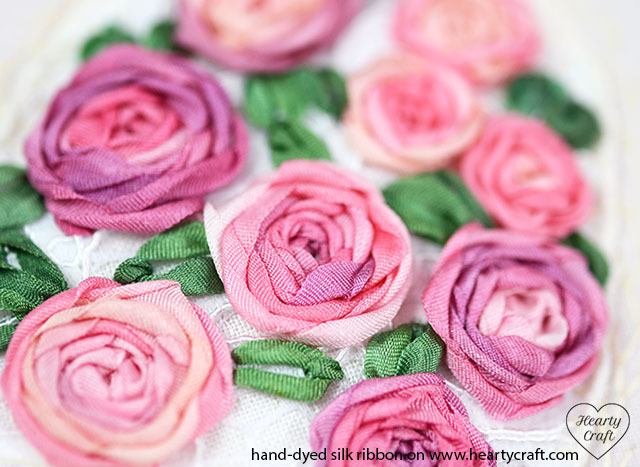 To stitch a rose you’ll need 4mm wide silk ribbon, embroidery or sewing floss, chenille needle (size 18), embroidery needle (size 8 or 9), tapestry needle (any size), piece of fabric, and a stitching hoop. Stretch your fabric in the hoop and then follow a step-by-step tutorial for the woven spider’s web stitch (click on the images to enlarge). 1. Stitch five spokes with an embroidery needle and floss that matches the colour of the ribbon. 3. Start to weave around the spokes, alternately passing the needle and ribbon over and under the stitches. 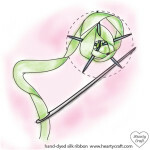 To avoid snagging the ribbon, pull it out from under the spoke to the side, as close to surface of the fabric as possible and not upward. 4. Weave two or three rows, tightening the ribbon. For the following rows loosen the tension, and let the ribbon twist. Twisting the ribbon is essential in creating the rose. 5. 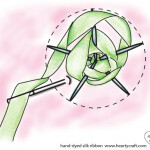 If the ribbon runs out, bring the needle through to the back, close to the last woven row. Secure the ribbon at the back.Bring the needle, threaded with the new ribbon, to the front, close to the point where the last piece of ribbon ended. Continue to weave the ribbon until the spokes are completely covered. I hope this tiny tutorial will be helpful. And I’d be very delighted to see your creations. Please, share with us on our Facebook page! 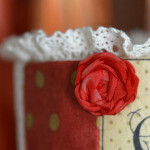 Just leave a comment with the photo attached under the Woven Spider’s Web Rose post. This entry was posted in Blog Posts and tagged How to, Roses, Silk ribbon embroidery, Stitches on 8th July 2014 by Zinaida.